Phuket is an island, more or less ... it is surrounded by water, but is connected to the mainland by the Sarasin bridge - well, Sarasin bridges actually ... there are now 3 spans across the 500m gap between Phuket and Phang Nga Province which lies on the other side. The first bridge was only built in 1967 and 2 more have been built in the last 15 years to allow a bridge for traffic each way, while the oldest bridge is now for pedestrians and is a popular evening walk for locals. Phuket is not just an island, it's a province of Thailand in it's own right, albeit the smallest! The total area of Phuket is less than 600 square kilometers including smaller offshore islands. Over the bridge is Phang Nga province, with an area of over 4000 square kilometers. Sometimes it feels like we have explored every inch of Phuket, and driving over the bridge seems like a big day out! 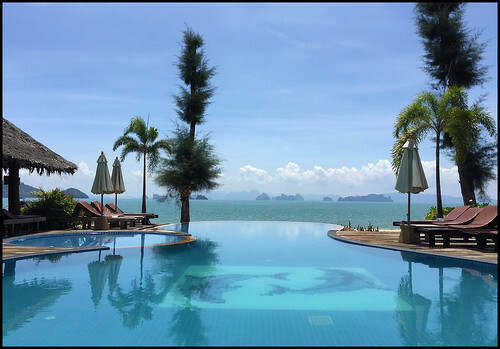 We have spent many days exploring Phang Nga and I noticed that the Phuket Blog now has over 20 pages relating to places in the neighbouring province, so this blog post is a way to tie everything together. Tempted to start a "Jamie's Phang Nga" blog actually, but not yet. 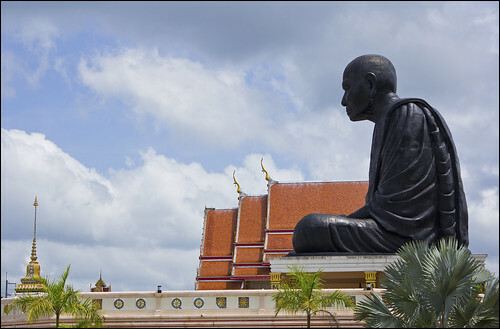 Everything on this page is within a few hours drive of Phuket. With favorable traffic we can be over the bridge into Phang Nga in 45 minutes. 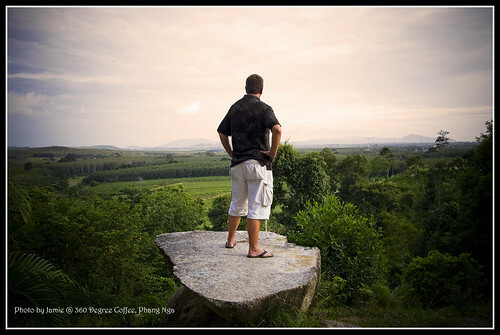 There's plenty yet to be found, but here's what we know of Phang Nga province so far. First on the list ... Phang Nga Bay including James Bond Island and Koh Panyee village, with limestone karst islands and beautiful scenery .. this has to be on most tourists "to do" list, which means avoiding the crowds can be tricky! We have that figured out now - just get there late when all the standard tours are on the way home. 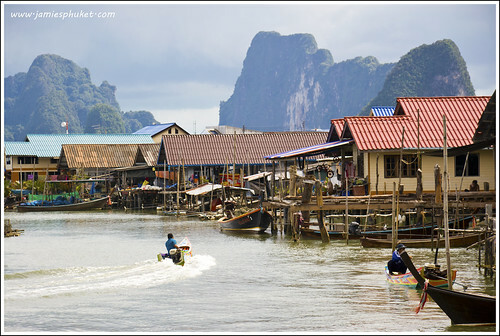 Read more : Phang Nga Bay - Doing It Our Way! 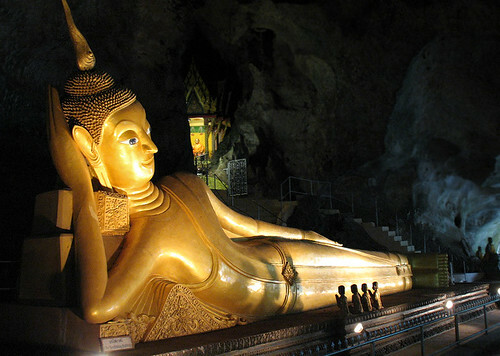 You can book tours like this with my friends at Easy Day Thailand. I am sure there are plenty more, but here's a few restaurants and cafes that we like in Phang Nga .... I am not suggesting a drive all the way just for lunch, but in combination with visiting other attractions, one of these places should hit the spot. 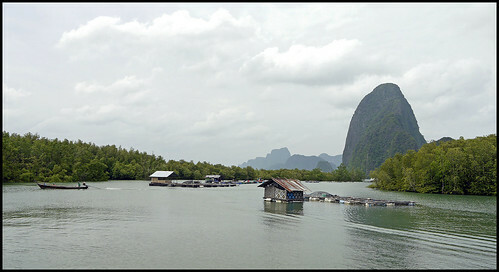 Our favourite I would say is Tha Sai Seafood, which is quite a drive, past Phang Nga Town and on the way towards Krabi. Great food and a great view! Another one by the water is Samchong Seafood (below), from where we have hired longtail boats a few times to head out into Phang Nga Bay. We heard that it gone downhill, but visited again in 2016 and it was still good. 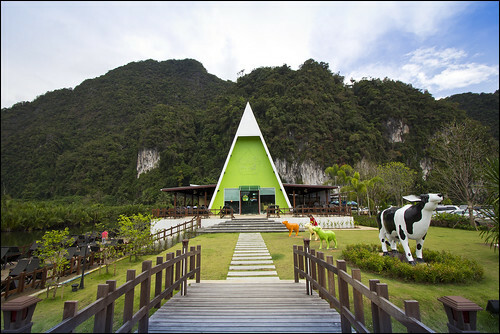 Another we have been to a few times is Dairy Hut Seafood, a 2nd branch of the Dairy Hut restaurant in Phuket Town. Next door they have now opened Dairy Hut Farm with animals to pet and feed including some llamas. 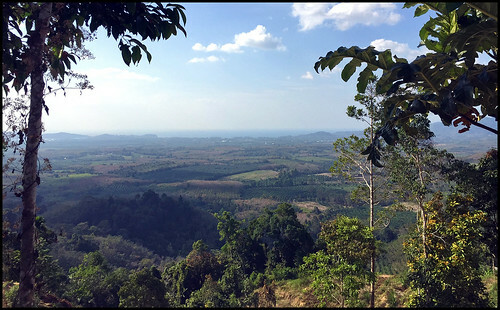 And there are a couple of little cafes which we know with nice views, just (for us) a place to stop for a drink - the Phang Nga Viewpoint Cafe, near Phang Nga Town and the 360 Degree Viewpoint Cafe which is just a few km north of the bridge. We have also recently visited a couple of restaurants near Wat Khao Waterfall which will be blogged in the near future. 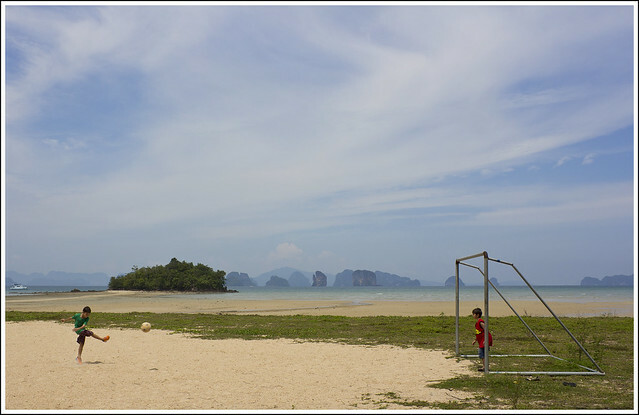 Phang Nga Province has plenty of beach property and it's mostly way quieter than Phuket. Khao Lak was really just becoming a destination in it's own right when the tsunami hit hard in 2004. Khao Lak suffered a lot more damage than Phuket, though of course now nearly 10 years later there's no obvious evidence of the disaster. I had never stayed more than a couple of hours in Khao Lak before 2013, but we booked a couple of nights to explore the area, and liked it so much we have had several more overnight trips there! See : Holidays in Khao Lak and One Night in Khao Lak. 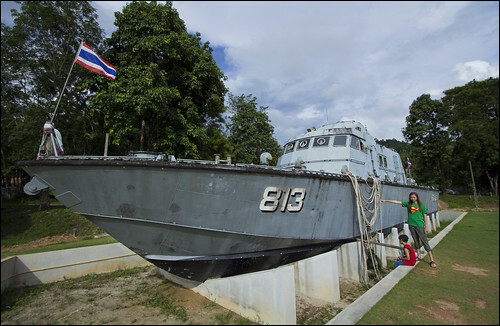 (above) One of the tsunami memorials in Khao Lak - this police boat was carried more than 1km inland and was left there as a reminder. Khao Lak is also the start point for most trips to the Similan Islands and other offshore islands. The Similans are a big destination for divers - it's why I came here in 1999, looking for work as a dive instructor. I wanted to dive the Similan islands and diving is still in my veins as manager at Sunrise Divers! A bit north of the Similans is Koh Tachai Island - I had dived there before but never been shore until 2013 when we did a day trip from Khao Lak. Wow. 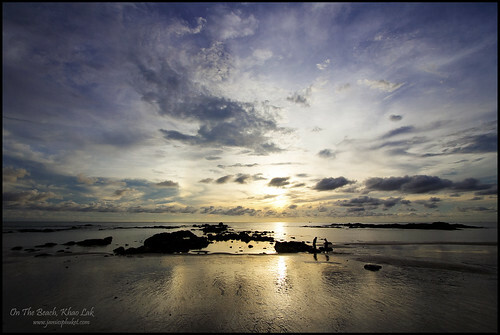 Khao Lak is about a 1 - 2 hour drive from Phuket, depending where you start in Phuket. From our house near Phuket Town, about 1 hour 30 minutes. Carrying on further north from Khao Lak you reach Takua Pa, which (100+ years ago) was an important trading port, just like Phuket. Now it's still a big fishing port and just outside the main town is the old town of Takua Pa which is similar to old Phuket Town only quieter. We've been a couple of times. 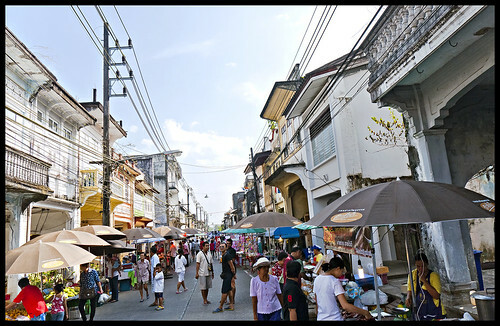 On Sundays in the high season they have a street market which we visited also, kind of like the Sunday walking street market in Old Phuket Town, but .. older! 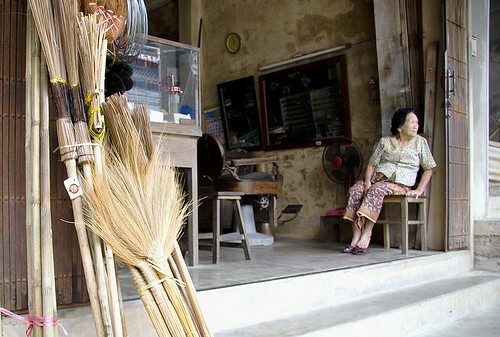 (above) In Old Takua Pa, and on market day. And further north still, and still in Phang Nga province, in between Takua Pa and Kuraburi is Sri Phang Nga National Park which features several waterfalls and we really must check out more of them, because once we found Tamnang Waterfall we decided that would do us just fine! It was more impressive in low (rainy) season although that meant you could not swim in the pool below the falls and a park ranger came with us to make sure we stayed safe. There are quite a lot of waterfalls in Phang Nga, we have stopped at quiet a lot. 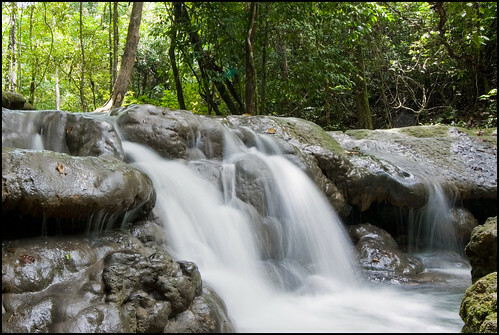 Lampi waterfall and Ton Prai waterfall south of Khao Lak are well worth a look - again, they are more spectacular in the rainy season, but still great places to cool off on a hot day in April! (above) Yeh, that's me enjoying the cool water at Ton Prai waterfall! 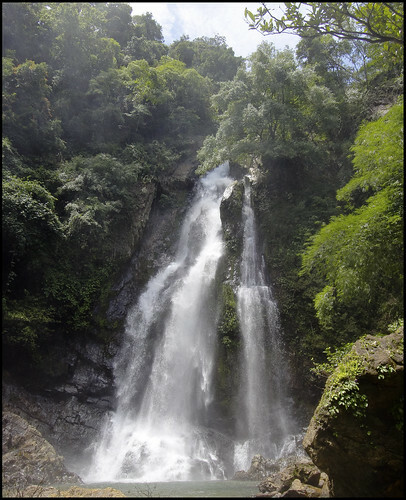 Another place with waterfalls that we like is Sa Nang Manora Forest Park, just north of Phang Nga Town. No big cascades, but a lovely forest setting, popular with locals at the weekend. 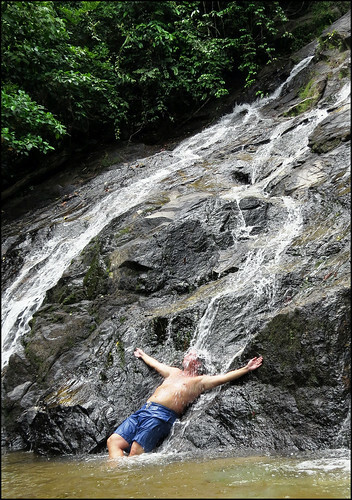 There's another place called Raman Waterfall Park south of Phang Nga Town that we do mean to check out one day! I do like my temples! 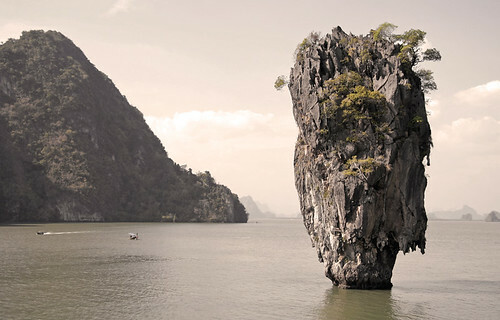 And Phang Nga has several interesting ones to visit and I am sure there are more to be found. The most famous is Wat Suwan Kuha, also called Wat Tham, which is built into a cave featuring a large reclining Buddha and lot of monkeys! 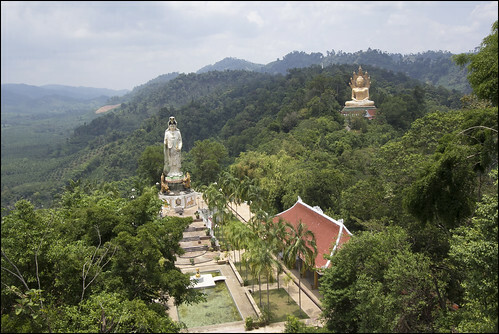 (above) Wat Suwan Kuha is found a bit before Phang Nga Town if you are coming from Phuket. Before that, on the left side is Wat Manee Sri Mahathat, which is home to a large statue of a famous Monk called Por Than Klai. In Phang Nga Town is one of the oddest temples I have seen - Wat Thamtapan features visions of heaven and hell. The Buddhist version of hell is all about different punishments for your worldly sins. 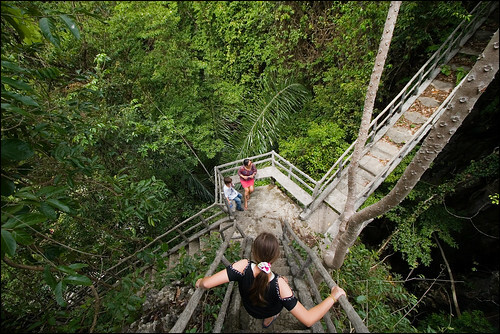 We ascended the steep stairs in the heaven section where you can find a view back across Phang Nga to the sea. And one more temple, well worth the long drive past Phang Nga Town near the small town of Thap Put, is Wat Bang Riang. I had seen pictures, but we did not really know where it was, finally "discovering" this place in 2012. North of Khao Lak is the town of Takua Pa (as mentioned above). 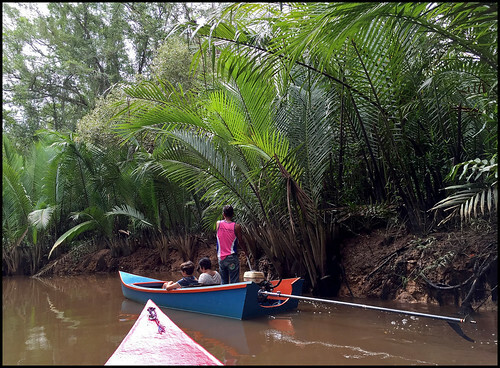 Just a couple of kilometers from the town you can start the Little Amazon tour along a small mangrove river looking out for wildlife such as snakes and monkeys. We did the trip in 2016 and it was fun! Also part of Phang Nga Province, sitting in Phang Nga Bay, just a short boat ride from the northeast coast of Phuket, are the islands of Koh Yao Yai and Koh Yao Noi. The former we have not visited yet. Koh Yao Noi we have been several times for day trips. It's a very quiet island with a mostly Muslim population, the main business is fishing and farming, though for sure the tourism is evident. We have enjoyed a couple of family day trips taking the boat and then renting scooters on arrival to explore. To the south of Koh Yao Noi, and larger, but actually less developed (although it does have a bunch of hotels of varying standards) is Koh Yao Yai island. We'd not been until 2016, and had a very nice overnight trip including a morning tour round some other islands such as Koh Hong. A beautiful place to stay. See - Koh Yao Yai Island. We did a very enjoyable little white water rafting trip in Phang Nga, north of Phang Nga Town near Tone Pariwat Waterfall. Trips like this can be booked with my friends at Easy Day Thailand. 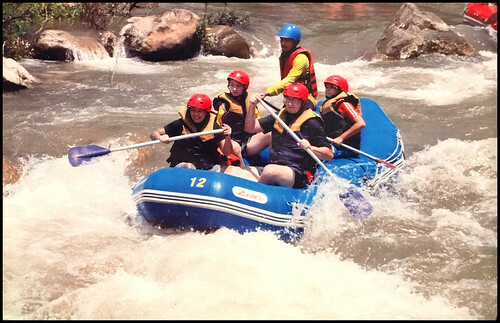 (above) That's me and the family on white water! 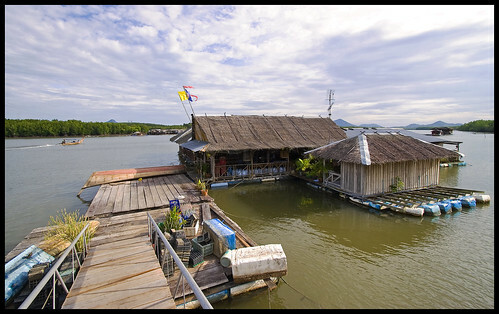 A place I had meant to visit for a few years, Bang Pat sounded very interesting, a little village hidden away in the mangroves with fresh seafood and homestays available. We stopped there in 2015, and I felt like it was like a poor man's Koh Panyee, we did not eat there, just looked around. Might go back for some food someday! 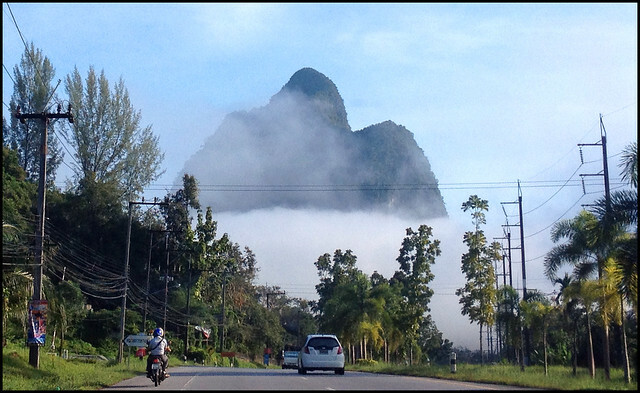 And pretty much no matter where you are in Phang Nga, there's some amazing scenery. 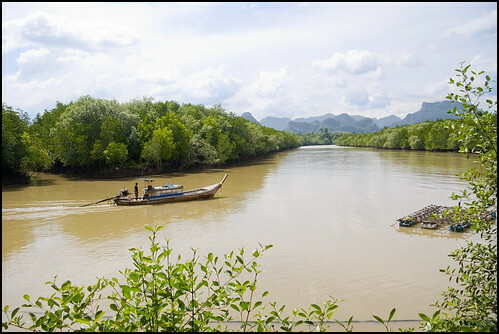 Especially along the roads near Phang Nga Town or on the way to Krabi. Those limestone karts that are found in the bay can also be seen on land. Hills jutting up everywhere. A drive can be worth it just for the views. I took the photo below one morning quite early (about 7:30am) with the mist hanging around the hills. And in June 2015, we did go looking for some back roads, a very nice area called Klong Kian, which is just over the bridge from Phuket to the east and covers an area half the size of Phuket. Quiet roads and some unexpected views from little fishing villages. We like this kind of exploring! A real WOW! I saw images on Instagram in early 2016 and realised we'd been near here before when visiting Klong Kian, but I had not seen any viewpoint signposted. Seems that someone has made a rough road up a hill, you pay 300 Baht, there are a few food and drink vendors and the views are amazing from here. 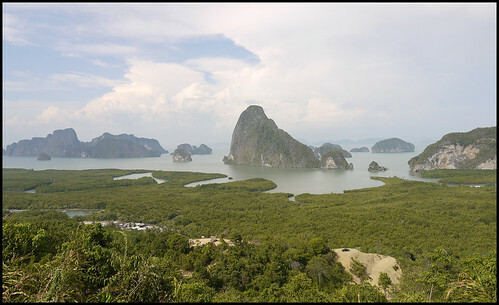 Read more : View from Samet Nangshe, Phang Nga. In between Phuket and Khao Lak, a place I tried to find a couple of times, it's not well signposted! Khao Kai Nui is a viewpoint on a hill, which you really need 4WD to drive up though we just about made it with a 2WD pick up truck. Great view in the day time, but it's meant to be best early morning with the fog lying in the lowlands. So we'll have to do it again! There's still more to explore in Phang Nga. I have seen signs to interesting looking restaurants, I want to check out some back roads, I want to go back to the viewpoints in the early morning. Need more time! Oh, to be a full time blogger! If you drive east through Phang Nga you get to Krabi which is just about close enough to visit in a day trip from Phuket. North to Phang Nga is Khao Sok National Park which makes a very long day trip, better to stay a night or 2, which we have done many times. Keep on exploring!